In many ways, South Africa leads the way in governance risk and compliance practices because of their advanced and progressive governance legislation. Learn how Exxaro, a South African mining company, implemented a highly unique and innovative approach going well beyond the key principles of three lines of defense. 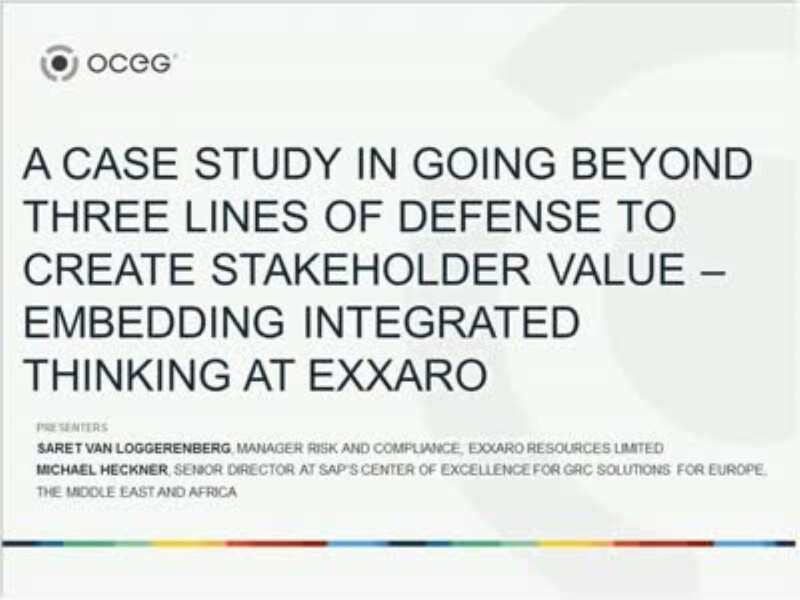 Using a risk based approach Exxaro has embedded integrated thinking into the organization. Their approach to three lines of defense starts at the “coal face” and ends at the Board of Directors. They have operationalized their practices and employed technology to scale and sustain their initiative. How Exxaro’s executives and board use the strategic performance dashboard derived from their initiative to drive the business. We have emailed instructions to access A Case Study in Going Beyond Three Lines of Defense to Create Stakeholder Value Embedding Integrated Thinking to . Make sure the email arrives in your inbox: either add "support@oceg.org" as a safe sender to your email platform, or if you use Gmail, drag our email into your Primary tab.